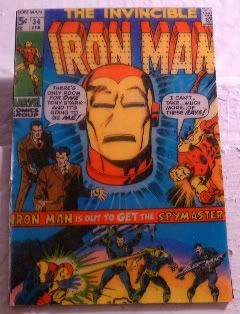 This is one of my Union Square magnet guy magnets - I've now had it for a while, just waiting for Iron Man 2 to come out. Awesome. Seriously. Am thinking that when the movie's produced in IMAX, that one should see that version. I did have a couple of issues with focus, because it was so big and in my face. Sometimes it was hard to pay attention to who was who and where people and drones were at any given time. But overall, IMAX was great. I say it like it's this new experience, but it's not. I just tend not to go to them, simply because of the crowds and the lines. I mean, I got to the 10am showing at 8:45. Ya'll, I don't even get to work at that time. And I was a good 25-50 people back in line. Nuts. And then the running? Really? Running? Up three flights? And you had to go with the flow, otherwise, with the trampling! Anyway, still fun to watch the fanboys. The movie itself was pretty good. Nothing will top the first, obviously. And this one charmed me with its use of the World's Fair fairgrounds in Flushing, Queens - a site that I love and hold dear. Seeing the big Philip Johnson NYState pavilion (where they placed the Stark Expo show) with all the great details - right down to the glass on top - that was fantastic. Just about as fantastic as Robert Downey Jr. looked in this movie. Jeepers, what a comeback. 1) Dang, I really need to go to Union Square when it's not crazy sunny outside so I can actually flip through the vendor stuff without burning my fingers because I *so* want an Iron Man magnet! 2) I assume you've been to the StarkExpo2010.com website, joy. They've got like layouts of the fairgrounds and everything. If you haven't I think you'd dig it. Plus, Howard Stark hamming it up, Roger Sterling style! OMG. O. M. G. That's the best site - EVER, cc. I LOVE it. Sigh. How much has Jon Favreau endeared himself to me even more.